14 night/ 15 day Botswana Safari which also includes Victoria Falls. Enjoy a comprehensive itinerary at lodges of quality. Explore Botswana is a wonderful holiday for first time visitors and return visitors alike. After clearing customs at Victoria Falls Airport, our representative will transfer you to Victoria Falls Hotel. This drive will take approximately 20 minutes. The Edwardian-style five-star hotel, built in 1904, was recently redecorated and refurbished and now combines the charm of the old with the convenience of the new. Set in lush tropical gardens with lily ponds, palm trees and semi-tropical shrubs, it provides the tranquillity and seclusion that many guests seek. The famous Victoria Falls are just a ten-minute walk away using the hotels private pathway, and the smoke that thunders or Mosi-O-Tunya in the local dialect, is clearly audible and visible from this luxurious landmark. The ambience of the hotel is steeped in history with all suites decorated in the gracious Edwardian style of Zimbabwe’s colonial era. The corridors reflect and tell the history of this unique part of Africa, with particular reference to the building of the railway from Cape Town to what is now Zambia. It is very much part of the unrealized Cape to Cairo dream of Cecil John Rhodes. After settling in to your en-suite Deluxe Central room, you may want to view the famous Falls later in the afternoon. They are a short walk from the Hotel and you would need to settle the entrance fee of US$30 per person directly. After breakfast at the Victoria Falls Hotel, the rest of the day will be at your leisure to enjoy some of the many activities on offer in Victoria Falls. There are a wide selection of activities on offer in Victoria Falls, including helicopter flips over the Falls, The Livingstone Express steam train ride over the Zambezi, a Sunset Cruise on the Zambezi River, a Cultural visit to a local village, a Tram Ride on to Victoria Falls Bridge, White River Rafting, Bungee Jumping, and Elephant Back Safaris. We can happily arrange any activities for you, and pre book them too, or you make book them at the Hotel once you arrive. After breakfast at the Victoria Falls Hotel, you will be transferred to Kasane, Botswana, where a representative of Chobe Elephant Camp will meet, and drive you to the lodge. The transfer from Kasane Airport to Chobe Elephant Camp will take just 40 minutes by road. Chobe Elephant Camp is a uniquely designed lodge, built to take advantage of the incredible views overlooking the sweeping Chobe River floodplains while offering a comfortable refuge from the harsh African conditions. Based in the semi-arid bush of Africa there is always the challenge of extreme temperature variations and how to combat this, the solution came in one of earths’ great insulators – the sand. The lodge has been entirely constructed from sandbags, the thick sand-filled walls create a natural insulating barrier between the inhabitants and the harsh African climate and enhance the old farm-style feel of the camp. 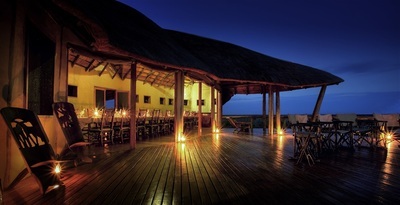 From the Pool area, the viewing deck overlooks a private waterhole. The main area is 252 metres square, and facilities include a Reading Corner, a Bar, a Lounge and Dining areas. Few people come to Chobe without taking a trip on the river to see hundreds of hippopotamuses and crocodiles or to witness the exquisite sanguine sunsets sinking slowly over the water. After breakfast at Chobe Elephant Camp, you will be driven back to Kasane Airport (40 minutes) for your charter flight to Mapula Lodge, 70 minutes away, across the Okavango Delta. Mapula Lodge is situated on a private concession of 12 000 hectares in the northwest seasonal floodplains of the Okavango Delta - the concession borders with the world famous Moremi National Park. The Okavango Delta is home to mammals such as lion, cheetah, leopard, wild dog, elephant, buffalo, hippo, giraffe, hyena, zebra, kudu, impala and many more! This aquatic region is also home to various bird, insect, fish and plant species - making it a safari paradise. Mapula Lodge is the perfect Botswana safari destination for anyone wanting to experience the beauty of untouched African wilderness. 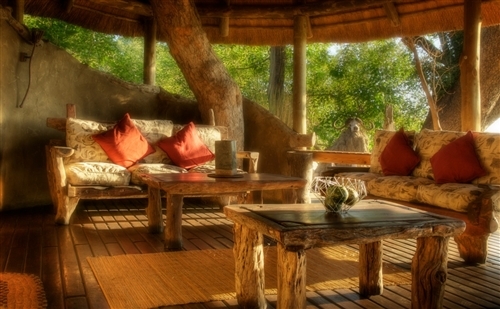 The lodge itself is wrapped around the trunks of African hardwoods. The panoramic view from each room engulfs you in the wonders of your surroundings, while the private verandas, shaded under the canopy of the delta, provide you with an ideal spot for high tea or sundowners. Mapula Lodge is able to offer a wide range of activities as it is on a private concession and therefore not subject to the same rules as camps in the National Parks. Mapula Lodge is also owner operated, making flexibility around additional requests far simpler! After your morning activity and brunch, you will be chartered from Mapula Lodge to Machaba Camp, 30 minutes away, across the Okavango Delta. Machaba Camp is located along the Khwai River on the edge of the Moremi Game Reserve, which is one of the most beautiful reserves in southern Africa, and offers spectacular game viewing. 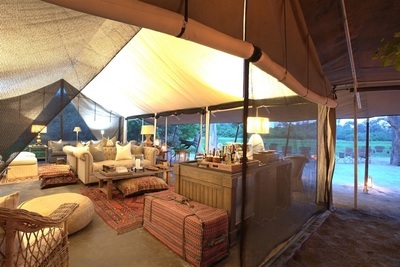 Machaba Camp appeals to the novice safari guest as well as to the seasoned safari traveller. Machaba has a game-viewing hide overlooking the river at which guests can be dropped off, and then collected again at a pre-arranged time. Other activities at Machaba centre around two game drives per day, including night drives, and bush walks. Short mokoro excursions are also offered, year round. The Khwai area is a big game experience - Buffalo, Elephant, Lion, Zebra, Wildebeest, Giraffe and many different species of antelope abound. The area offers a blend of open grasslands, seasonal floodplains and the permanent water of the Khwai River system. After your morning activity and brunch at Machaba Camp, you will be chartered to Nxai Pan Camp, 50 minutes away. Nxai Pan National Park lies just north of the Maun-Nata road and adjoins Makgadikgadi Pans National Park on its northern border. In 1861 the famous painter Thomas Baines arrived to paint an unusual group of baobab trees, one of which lies on its side and hence these beautiful group of trees became known as Baines Baobabs. The Pan itself is another fossil lake bed about 40 sq. km in size. The landscape is largely covered by grassland and dotted with clusters of umbrella acacia trees and mopane woodland in the north. During the rains from November to April the pans become covered in grass which is a landscape very similar to the Kalahari. The famous group of baobab trees known as Baines' Baobabs is situated in the south of the park. 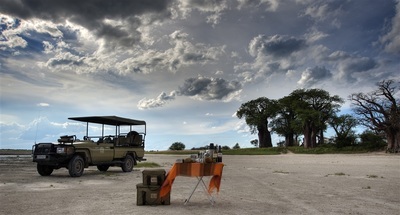 Activities at Nxai Pan Camp include Game drives in open 4 x 4 vehicles, historical tours to Baines Baobabs and Pandamatenga Cattle Trail, as well as walking. Nxai Pan is well known for its huge springbok population once the rains have started (November), when gemsbok, elephant and zebras migrate to the region. At this time zebras come in their thousands to drop their young at Nxai Pan. Extraordinarily large herds of giraffes can be seen with up to 30 in a group. These large herds of zebras, springbok, and wildebeest attract many predators including lion, cheetah, jackal and both spotted and the elusive brown hyena, as well as the endangered wild dog and the secretive leopard. There are large numbers of bat-eared fox and raptors that prey on the rodents and reptiles. At times, Rhinos have also been sighted. Also to be seen are the eland, greater kudu and red hartebeest. Once the rains have started the bird life is excellent. After an early morning activity and breakfast, you will be chartered from Nxai Pan Camp to the Central Kalahari, some, 60 minutes away. Tau Pan Camp is located near Tau Pan in the Central Kalahari Game Reserve and the camp itself is situated on an established sand ridge overlooking a permanent water hole. Every activity has both a guide and a tracker present, with a maximum of 6 guests per vehicle. Activities include game drives, walks, evening drives, and day trips. Rainfall varying between 170 and 700 millimetres per year generally falls between late November and March. During these summer rains the Reserve completely transforms as virtually overnight the plains and pans burst with flowers and sweet grasses. At this time the Kalahari is one of the best game viewing areas in Botswana, and migratory species such as zebra and wildebeest return to the grazing lands in their thousands. Many other antelope species are found in the Kalahari including. Predators abound including the famous Kalahari black-maned lion, cheetah, leopard and wild dogs. The extremely rare brown hyena is only found in the desert environment. The winter/dry season, from May to September, is an equally wonderful time to visit the Kalahari as the many resident species and predators congregate close to any surface water and pans. Activities offered at Tau Pan are game drives, day trips to the well-known Deception Valley, Sunday, Piper and Passarge Pans, star gazing, bush brunches on Tau Pan, and nature walks with Bushman trackers.